The idea for this recipe came to me during a week when I purposely didn’t stock up on groceries. Evan and I were traveling over the weekend and I wanted to use up what we had in the fridge before we left. Sometimes my most creative recipes derive from situations like these; I end up with a handful of random ingredients and I try to make something tasty out of it. Earlier in the week, I tried a new curry recipe and when it came time for dinner, I totally forgot to take the naan out of the fridge and serve it alongside the meal. So flash forward a few days and I’m left with naan, along with a handful of fresh ingredients to use up. 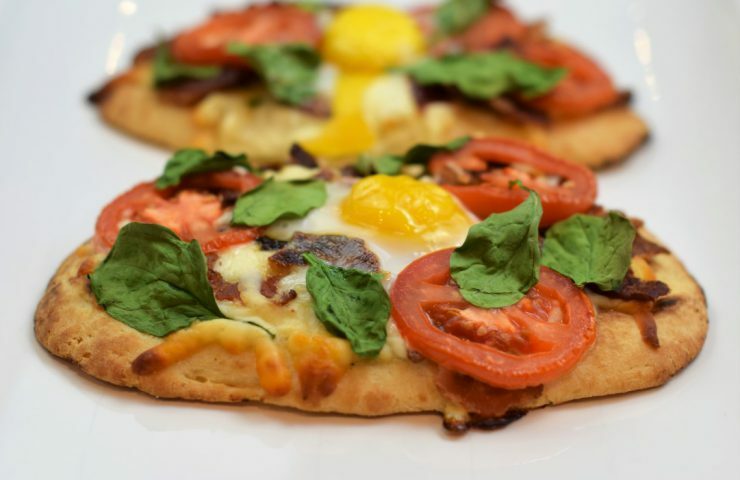 Instead of making traditional pizzas with naan (since we do pizza and wine on Thursdays), I decided to try something a bit more unique. 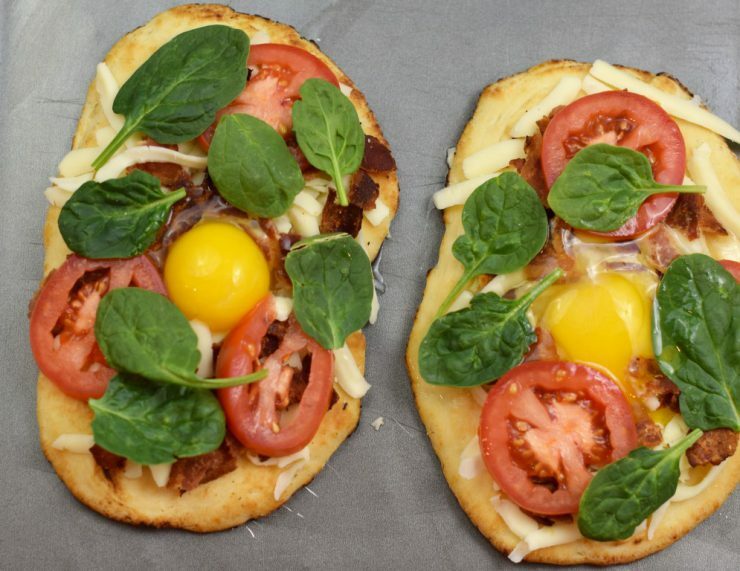 I added eggs and bacon, along with some tomatoes, spinach, and cheese, and called it breakfast pizza. The result: something amazing that I would argue you could eat for breakfast, lunch, or dinner. Begin by preheating the oven to 450 degrees. Lightly grease a baking sheet before adding the naan. This is an important step if you want to avoid scraping cooked naan off the baking sheet. I say this based on experience; I usually forget to do this. 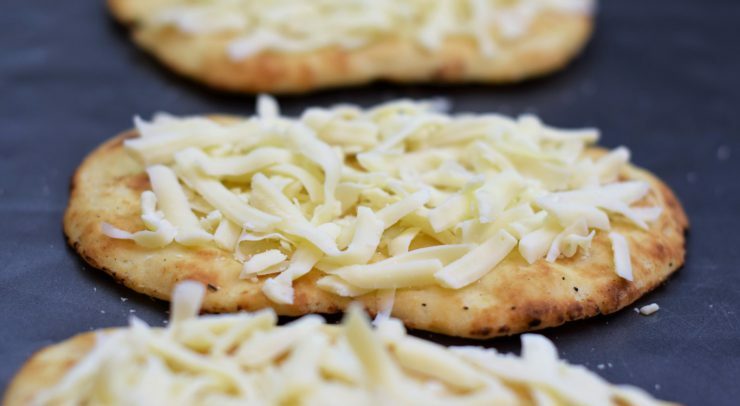 Add about 1/4 cup of shredded cheese to each piece of naan. I like to use mozzarella, but use whatever cheese you like. Depending on the size of your naan, you might want to add a little more or less. 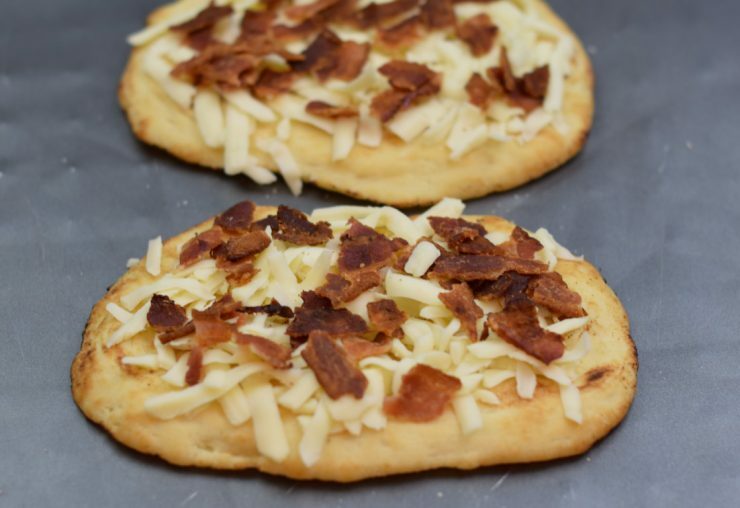 Crumble about 1 strip of cooked bacon and add it to each naan. Again, this can vary based on size of naan and personal preference. Layer about 3 very thin slices of tomato on top and then add 4 to 5 spinach leaves. In the middle of the naan, create a small valley in the toppings so when the egg is added it stays put and doesn’t run off the naan onto the baking sheet. Carefully crack one egg into the valley you just created. 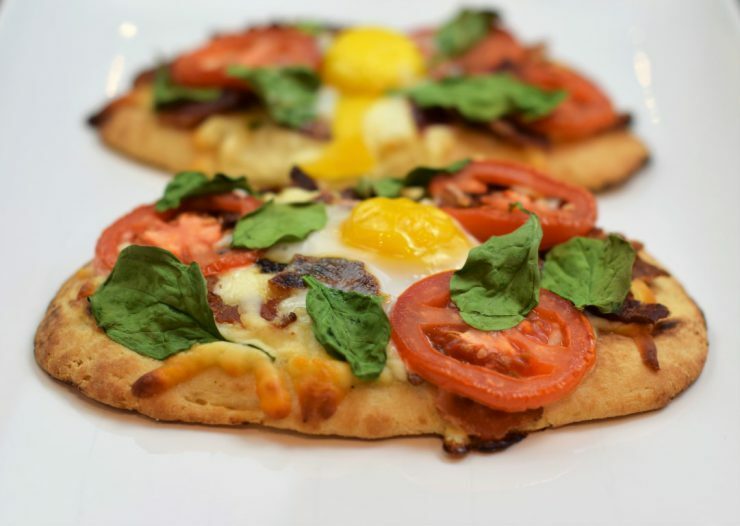 Depending on the size of your naan, you may want to add multiple eggs. If you’re using smaller naan like mine, I’d recommend cracking the egg over a bowl and removing about half of the egg white before transferring to the naan. Otherwise you’ll end up with too much egg that likely runs off the naan. Transfer the baking sheet to the oven and bake for about 10 minutes, until the whites are set and the egg yolk is cooked to preferred doneness. Another lesson learned while using small naan (and another reason to remove some of the egg white ahead of time): they likely will require more time in the oven to ensure the whites set and this can result in overcooking the yolks. On larger naan with more area for the egg to spread out, this shouldn’t be an issue. 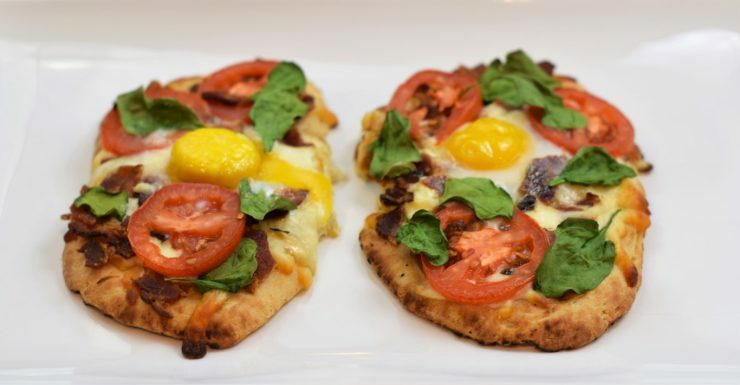 Once the eggs are cooked, remove from the oven, and slice into strips using a pizza cutter. Serve immediately! Preheat the oven to 450 degrees and lightly grease a baking pan. 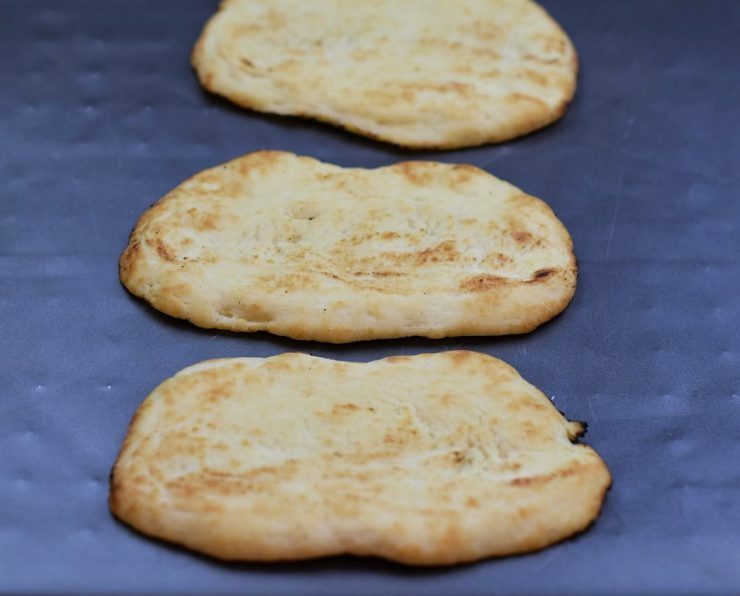 Place the naan on the baking sheet. 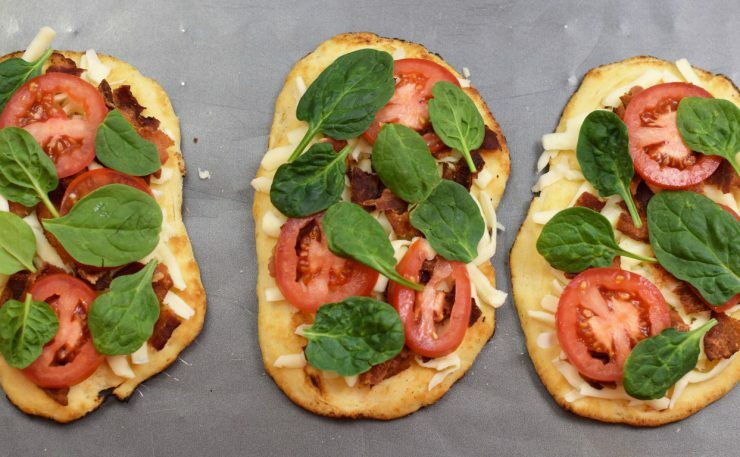 Add shredded cheese, crumbled bacon, sliced tomato, and spinach leaves. 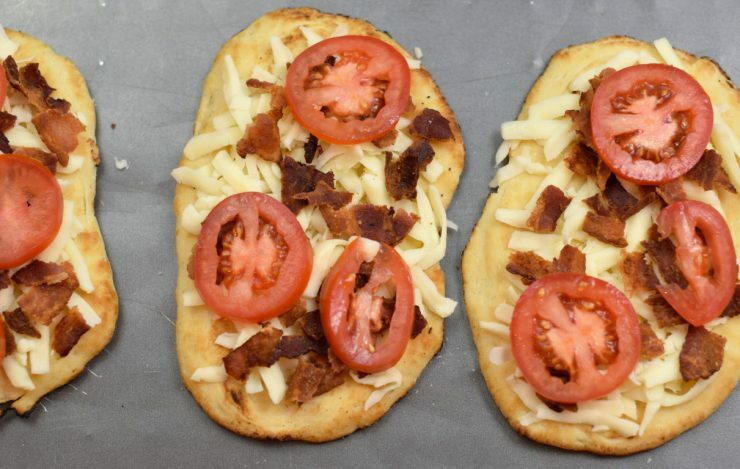 Create a valley in the toppings in the center of the naan. Crack egg into the valley. Transfer to the oven and bake about 10 minutes, until the whites are set and the yolk is cooked to your preferred level of doneness. 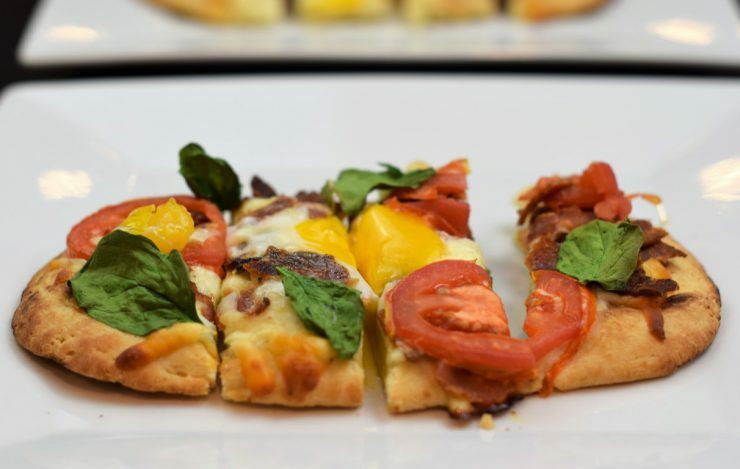 Slice with a pizza cutter and serve immediately.